JAMMU, India, Mar 6 2018 (IPS) - In the semi-lit makeshift tent covered with strips of cardboard, five women sit in a huddle. As their young children, covered in specks of mud and soot, move around noisily, the women try to hush them down. Hollow-eyed and visibly malnourished, all the women also appear afraid. Aged 19-30, they have two things in common: one, they are Rohingya refugees from Myanmar and two, they all live in fear of being sent back to the country they were forced to flee. “I came here when I was 13. Now I am 19,” says Nur Kalina, the youngest. She faintly remembers running with her parents from their village in Myanmar’s violence-wracked Rakhine state. All the other women in the room – Leila, Shamshida, Taiyyaba and Rahena – nod. Their stories are not very different from Kalina’s. Each one of them came to Jammu in 2012. Since then, the rows of huts in the Kiriyani Talav neighborhood of northern India’s Jammu city have been their home. They all got married here and became mothers. Each one of them has relatives who are still living in Sittwe who call every now and then to talk about the current situation. Every time, they share news of fresh attacks and new names of relatives and neighbors who have been murdered. “They always tell us, don’t come back here,” says Laila. There are around 5,743 Rohingyas in Jammu & Kashmir state, according to the state government. Scattered over Jammu, the summer capital of the state, and neighboring Samba district, their number is a fraction of that in Bangladesh (858,898) or Pakistan (350,000). Yet this tiny population is at the center of a controversy with some local factions accusing them of indulging in criminal activities such as land grabs, illegal settlement and aiding terrorists, and demanding their repatriation. One of the political parties spearheading the opposition against the Rohingyas is the Jammu and Kashmir National Panthers Party (JNKPP), a Jammu-based right-wing group led by Harshdev Singh. Singh, formerly a minister in the state, would not talk to IPS despite granting an appointment, but his party has been very vocal in demanding a quick repatriation of the Rohingyas. On March 3, he led a protest march in Jammu and urged the home minister of India to send back the Rohingyas, who he described as a security threat. “The illegal immigrants pose a threat to communal harmony and pluralism of Jammu. The Union Home Minister should personally intervene and direct the state government to take necessary action in this regard otherwise the situation in Jammu could take an ugly turn like in Kashmir,” Singh was quoted as saying by local media. Opposition to the Rohingyas intensified after a terrorist attack on an army camp in Sunjwan, an area on the city outskirts. Right after the attack, Kavinder Gupta, a local politican, accused the Rohingyas of being involved in the attack. Although he was criticized by other lawmakers, his party members stood by him. India, which has not signed the International Refugee Convention, asked the states in August 2017 to identify the Rohingyas for a possible deportation. The decision, however, has since been challenged in the Supreme Court of India by some Rohingya refugees. Hazara, who asked to go by her first name only, is a 29-year-old Rohingya refugee woman living in a hut bordering the army camp in Sunjwan. Like all the other women Rohingya refugees, Hazara never went to school. With no education and no specific skills, the single mother of two was earning her livelihood by shelling walnuts for her non-Rohingya neighbors. The wages of INR 12 (less than a quarter) for each kilogramme of walnuts were not very high, but they helped the woman feed herself and her family. However, since the attack on the army camp, it has become difficult to find work. “The next day when I went to work, they said, ‘You are troublemakers, we don’t want you here.’ Everyone was looking at me suspiciously, as if I have done something very bad,” recalls Hazara, who is now working as a part time domestic for a Kashmiri Muslim family. This will help her pay the rent for the hut – a princely sum of INR 500 (about 7 dollars) – but not enough to feed herself and her children. Hazara is largely dependent on a Madrasa (religious school) run by fellow Rohingyas for her survival. Mushtaq Ahmed, one of the 16 teachers at the school, says that right after the attack on the army camp, security forces entered the school to question them about the assailants. Since then, the attitude of the neighbors changed dramatically. “Since 2017, we have been hearing things like we are collabrating with militants, helping them, etc, but this time, the attacks are more direct. Some women are still shelling wallnuts, but once the season is over, who knows what will happen?” Ahmed said. There are 40 Rohingya refugee families in Kiriyani Talav locality. None of the women in these families has had a formal education. Uneducated and unskilled, they were married before the age of 18. Nur Kalina was married at 14. “The elders in the community said it’s a sin to stay unmarried for long. So my parents got me married soon after I started to menstruate,” recalls Kalina. All of 19, the young woman already has three children. “Child marriage is rampant in the Rohingya refugee community,” says Ravi Hemadri, who heads the Development and Justice Initiative (DAJI), a Delhi-based NGO that partnered with UNHCR until last month in documenting the Rohingya refugees and helping them access the aid and support they are entitled to. At DAJI, activists have been campaigning against early marriage, Hemadri says, but the progress is slow. The refugees live in extreme poverty which drives the families to marry off their daughters early, he explains. Laila Begum, 34, and Taiyyaba, 29, have asthma, while Taiyyaba has a 3-year-old daughter with stunted growth and weak limbs. As many as 12 women in the camp said they are suffering from respiratory diseases, while some, including Kalina’s mother Medina, 54, has tuberculosis. Kalina also has chronic lower back pain that often keeps her in bed. None of the women gets regular medical treatment because they can’t afford it. Laila, who has visited the government-run hospital a few times for free medicine, says that the hospital asked her to pay INR 2000 (about 30 dollars) for medicine the last time. “I don’t have so much money,” she said, adding that only the widows among them are entitled to some aid – 10 kgs of free rice each month. Early this year, the UNHCR ended its partnership with DAJI in Jammu. The UN organization also advised the Rohingyas to move elsewhere in view of the growing political opposition. 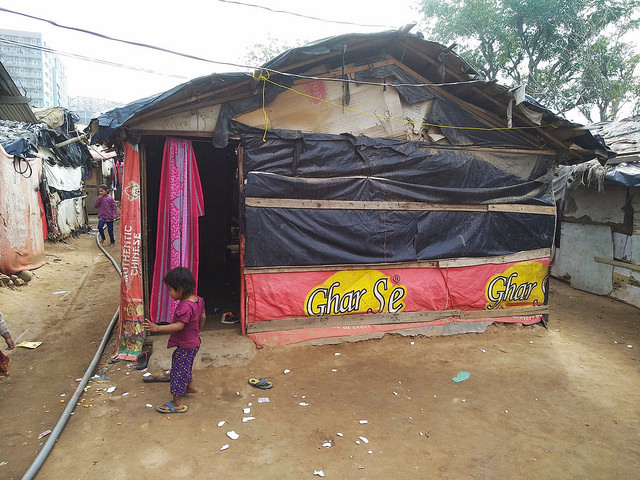 Since then, some of the Rohingya refugees – about 200 of them – have indeed moved out of Jammu. But the women refugees say that despite the growing threat to their safety, leaving is not an option. “In Burma, they are still killing our people. Here, they say we are Bangladeshis. We do not even speak Bangla. Where shall we go? Why shall we leave? 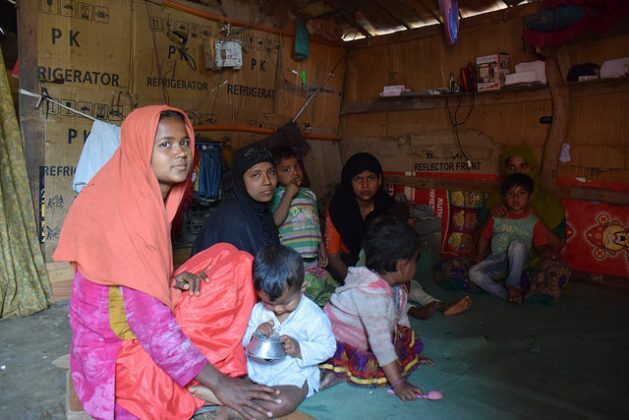 There is no safe place for us, so only way is to keep quiet,” says Ansari, a Rohingya woman.